The Denon DJ SC5000M prime may only be one letter different to its not-so-little-brother, the SC5000 but that one letter makes it all the more… More! 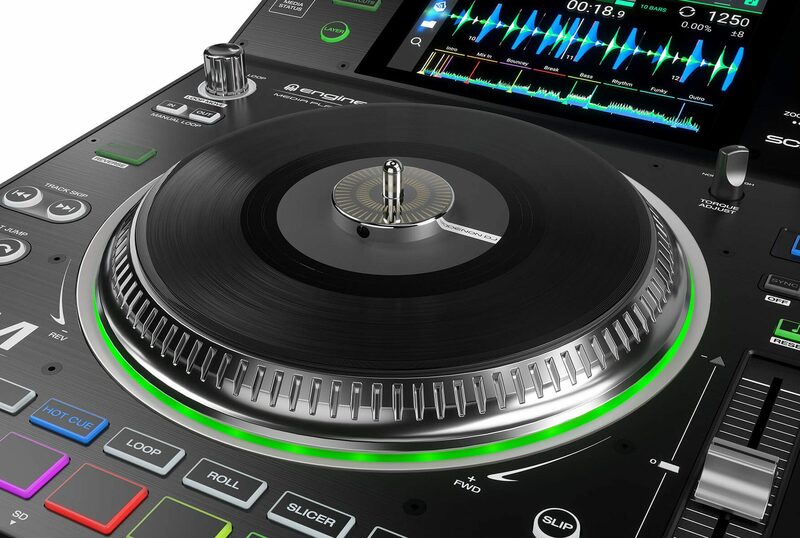 The Multi tech award winning SC5000 Prime design has now been enhanced with the addition of a 7” motorised platter delivering the true and mechanical feel to the fingertips of you, our loyal and humble DJ. If you’re a vinyl DJ, were a vinyl DJ, or wanna be like a vinyl DJ, the SC5000M prime will deliver that vinyl experience. It houses a super-duper high resolution platter boffins counted 3600 ticks per rotation from it’s brushless DC electric motor. Its more powerful and more capable than any motor previously found on a Pro DJ media player. I’m pleased to announce it’s adjustable vinyl tension for scratching and slip control to your liking, too! For those that aren’t au fait with the Denon family tree, the SC5000M media player is the latest in a long, line of motorized platter-players. All the way back in December 2002 Denon released the DN-S5000 and it hosted many world firsts. First and foremost was its rotating platter, complimented with the world first Alpha track where you could play two tracks off one disc, and a fully removable slot-in drive. Then we had the DN-S3500, offering the High Torque direct drive motor. Soon after the S3700 came along, direct drive motor and 9″ vinyl platter design, as well as D-Link to connect to other players for track data. Then the SC3900 came along, with a redesigned brushless 9-inch direct driven platter and player link for up to 4 players. If we then fast forward and look at the current InMusic roster, it’s a comforting feeling when we know Rane’s TWELVE Serato controller was designed in the same house, and therefore its safe to say they are cousins. The SC5000M is the same form factor and feature set as the SC5000; hosting a beautiful 7” multi touch screen; an apple-like user interface to access the fine finishes and features hosted within. From simple track searching, swipe to load, pinch and stretch waveforms as well as navigation and track filtering being easily accessed from the touch screen. Of course your music collection can still be analysed on board thanks to the SC5000M multicore processor. Don’t forget you can import Pioneer DJ Rekordbox playlists, tracks, hot cues and loops. Denon DJ’s Engine Prime software for music management is completely free and can be viewed here. 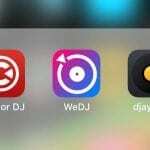 If you’re rocking with iTunes, Serato DJ Pro or Traktor, the Engine system will also handle the importing of those tracks, hot cues and loop information. Very clever. If only DJ Shrek could check the layers out on this bad boy! The Denon DJ SC5000M is actually a dual layered media player, combining double deck capability and outputs. These can be used for instant doubles entirely within one machine, or to run a 4-deck mix with just 2 physical machines. No laptop is needed for this. After layers, there’s still more to love; Denon DJ’s SC5000M hosts the class leading timestretch algorithm for the most beautiful key lock with the most extreme tempo changes. The SC5000M also hosts 8 expressive control pads across the bottom of the unit for hot cue access, track remixing on the fly, looping, slicing and rolling. As mentioned earlier, the Denon DJ SC5000M is the perfect media controller for “DJs of all levels of both experience and inquisitiveness” quote Denon DJ, and we agree! 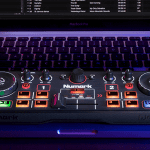 It doesn’t matter what your previous experience was, the moving platter gives the user a direct, hands on and familiar feel to their performance. The 7” platter is also reminiscent of 45 singles too. Kenny ‘Dope’ Gonzalez (one half of the legendary Masters at Work) is amazed at how the vinyl feeling has been put back into the DJ booth. The fact that it’s a dual layer media controller but now with the EXACT feel of a turntable makes him very excited indeed. For those wondering about connectivity within the SC5000M, it links harmoniously with the SC5000 so you can link any combination of 4 of the SC5000’s and SC5000M’s together.